Bus from Johor Bahru to Muar is one of key services in Johor Bahru Larkin Bus Terminal because of strong demand for bus between the two cities. Many commuters travel frequently between the Johor Bahru and Muar for various purposes. KKKL, Mayang Sari and City Holidays are the three major players who run the bus from Johor Bahru to Muar. In fact, these brands are famous in Southern Peninsular Malaysia. They have many other reputable bus routes like Johor Bahru to KL and Johor Bahru to Melaka. The operators have strong teams in running the operation in an excellent manner. Polite and knowledgeable counter staff serves passengers well during ticket purchase and check-in. Furthermore, they also employ experienced and safety-oriented drivers to bring passengers to their destinations in a safe and timely manner. 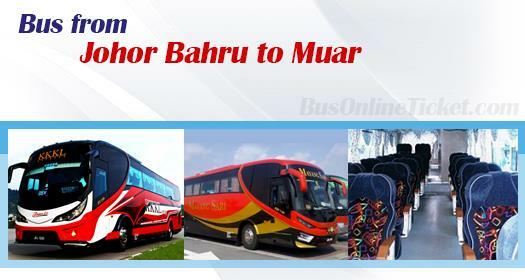 The duration for bus from Johor Bahru to Muar takes about 2 hours. Normally, coaches will go directly to Muar without stopover along the highway, unless washroom break is requested by passengers. The bus fare for bus from Johor Bahru to Muar is about RM 16.70 to RM 17.00. During festive seasons like Chinese New Year or Hari Raya, bus fare may adjust higher slightly. All coaches from Johor Bahru to Muar depart from Larkin Bus Terminal and terminate at Muar Bus Terminal, also known as Bentayan Bus Station. This station is right at the heart of city centre and it is convenient to go to from most areas in Muar. Even though there are frequent Johor Bahru to Muar bus schedules provided by KKKL, City Holidays and Mayang Sari, passengers are advised not to purchase tickets at the last minute at a ticketing counter. Tickets may be sold out for the next departure trip. In order to avoid lengthy waiting time at Larkin Terminal, passengers can simply book tickets online in advance at BusOnlineTicket.com. Your booking is instantly confirmed after payment is securely transacted in BusOnlineTicket Portal.